The Internet Explorer 8 tutorial series shows you some of the things you can do with Microsoft's popular web browser. Once you have looked through the articles, you can change some of the options to suit your own situation. You are also able to easily speed up IE8, or reinstall Internet Explorer 8 if you need to. This is the 1st of a 6 part series. 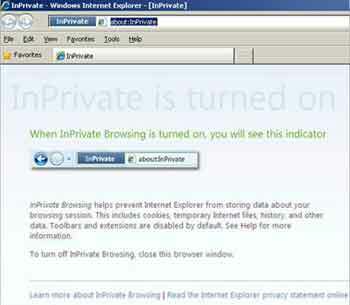 Here I introduce you to some of the new features in IE8, such as Accelerators and InPrivate Browsing. Part 2 continues to introduce new features of the browser software, such as the SmartScreen and Smart Address Bar Searches. Part 3 shows you how to change certain options such as enabling parental controls and deleting Internet Explorer history. Is your Internet Explorer Slow? Part 4 shows you how to speed up IE with minimal effort. Part 5 continues with more suggestions on how to stop Internet Explorer Running Slow. Part 6 shows you how to Reinstall Internet Explorer. Sometimes it is necessary when all else fails. There are also plenty of images to help you see how easily and quickly you can do this stuff. You honestly don't have to be a computer geek to do this. Give it a go. You will surprise yourself. Released in March 2009, this version of Internet Explorer marked the beginning of Microsoft's attempt to compete with other established web browsers such as Mozilla Firefox and Google Chrome. There are lots more options in version 8 to make it faster, easier and safer to use. Some of the main feature changes are introduced below. The links in the table of contents below send you directly to each feature that is discussed in this article. You control whether you read the whole page, or the feature of interest. Step 4 gives you the opportunity to share with everyone what you use IE for, and share any hints and tips to get the most out of your browser. Step 5 enables you to jump directly to the contributions from other visitors. Take a look. You may find out something new! Share Your Internet Explorer Tips and What You Use IE For! Accelerators make it quicker for you to do your web browsing without leaving the page you are on. To use the Accelerator option, follow the steps below. Open a web page and highlight a word or phrase to explore further. To highlight text, put your mouse icon just before the word or phrase, hold down your left mouse button, then move your mouse icon across the word or phrase until it is highlighted. Let go of your mouse button. The Accelerator icon appears. Left click this icon and a menu appears. This menu is your Accelerators. If you want to download more Accelerators, go to the All Accelerators > Find More Accelerators menu option. In the example below, I decide to search the phrase computer support by selecting the Search With Bing Option. Internet Explorer 8 loads Bing in another tab and automatically searches the word or phrase for you. There are lots of Accelerator options such as language translators, eBay searches and address searches with pop-up maps. The choice is yours. Tip: Right click the menu bar (where File, Edit, View, etc., are) to control the toolbars you want to be visible. InPrivate Browsing stops Internet files from being put onto your computer, as is the case with standard web browsing. Every page, photo, user name, password and site visited is stored on your computer. This can be risky. For example, if you complete a sign-up form or sign-in to an e-mail account on a public library or Internet café computer. InPrivate filtering prevents embedded content from displaying on a page (an advert, for example). How to set this up is discussed on the Internet Explorer Updates page. To enable InPrivate Browsing. Click Tools > InPrivate Browsing. Easy! When you are finished browsing, close the InPrivate browser window (File > Exit). Tip: Do you open your browser to find it does not fill the screen? Double left click (quickly) the blue bar where it says 'Windows Internet Explorer'. Web Slice is just a fancy term for one of your favourites informing you when the site is updated. Web sites where information changes quickly are the best, such as e-mail, sports scores and weather forecasts. The web slice of your choice sits on your Internet Explorer 8 favourites bar. You simply click the web slice to view the updated information. IE automatically checks each web slice for updated content. The web slice flashes to let you know there is updated information. Web slices on a given web page are accessible by the web slice icon . Watch the short video below (less than 2 minutes) which shows you web slices in action. Tip: To open a new tab quickly, press the Control Key (ctrl) at the bottom left and right on your keyboard, and while it is pressed down, hit the T key. Internet Explorer 8 is a feature rich web browser. Next go to Part 2 for details about the SmartScreen and Smart Address Bar Searches. Bright Hub (Opens New Window) offer several quick guides to IE8, starting with a What's new introduction. Microsoft IE8 Features (Opens New Window) also offer introductory IE8 guides for home computer users. Do You Have Any Hints & Tips to Share? Share your hints and tips to get the best out of Internet Explorer. Have you changed any settings? Do you use any features? Enter Your Title e.g. "Web Slices - Unsung Hero"